Sustaining paayments for the 2019 Texas Classic Futurity and Derby series are due Monday, April 15. ELGIN, TX—APRIL 8, 2019—Sustaining payments for the 2019 $1 million-est. Texas Classic Futurity(G1) and the $400,000-est. 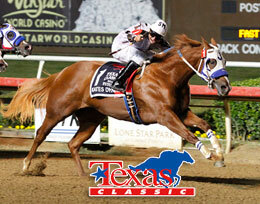 Texas Classic Derby(G2) are due Monday, April 15. A $400 payment is due April 15, 2019 to sustain American Quarter Horse foals of 2017 to the 2019 Texas Classic Futurity(G1). Late nominations for $2,250 ($400 plus all payments to date) will be accepted to the futurity through April 15. Trials will be contested October 19th at Lone Star Park and the final is set for Saturday, November 9. CLICK HERE for the current list of sustained nominations for the 2019 Texas Classic Futurity(G1). A $400 payment is due April 15, 2019 to sustain American Quarter Horse foals of 2016 to the 2019 Texas Classic Derby. Late nominations for $2,250 ($400 plus all payments to date) will be accepted to the derby through April 15. Trials will be contested October 18th at Lone Star Park and the final is set for Saturday, November 9. CLICK HERE for the current list of sustained nominations for the 2019 Texas Classic Derby(G1). Completed sustaining payments and late nominations must be postmarked and mailed no later than April 15, 2019 to: Texas Quarter Horse Association, 14 N. Main, Suite B, Elgin, TX 78621.